Shifting Sands, the third episode from the PERTEX ‘Elemental Journeys’ series. Shifting Sands is the third episode released on 5 February at 9:00 am as part of a six-part film series entitled ‘Elemental Journeys’, commissioned by PERTEX®, and produced by Sum tenants Coldhouse Collective. 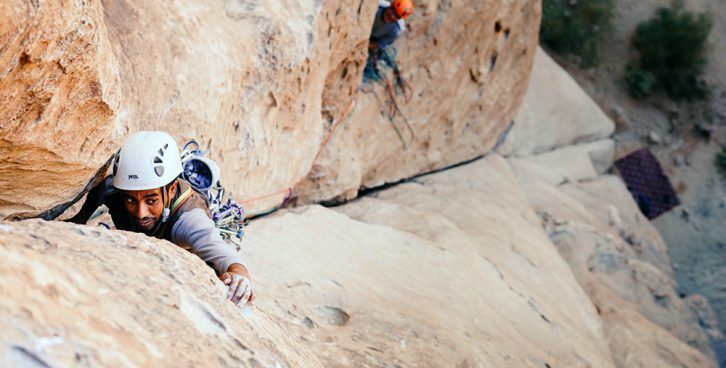 A tale of the friendship and camaraderie shared between the Bedouin community and climber Rob Durran, Shifting Sands takes us on a journey into the sandstone towers (or ‘jebels’) of Wadi Rum, peering into thousands of years of climbing history. British climber Rob Durran has been one of the most active and prolific climbers to visit Wadi Rum in Jordan in the past fifteen years. Rob has been hosted by the Bedouin on each of his trips, and in Shifting Sands he reveals the delights of climbing with these ‘honourable, proud nomads.’ Teaming up with local climber Abdallah Al Zalabeh, Rob travels to a remote corner of the desert to rediscover and climb an old Bedouin hunting route.